Which way do we go? 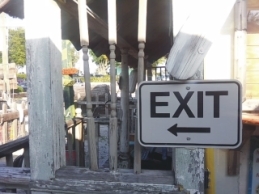 Mark those entrances and exits to parking lots, strip malls and many other locations with Street Sign USA's line of Enter/Exit Directional Signs. Avoid vehicular and pedestrian accidents in high traffic areas by providing guidance. Use for condo complexes, hotels, business properties, campgrounds and more. Direct vehicles where to go, guide pedestrians in the right direction. Rust free .080" aluminum is strong & stands up to all types of weather.